State of the art stainless steel Decontamination or Reprocessing clean up sinks have everything you need to maximize workflow and optimize infection control. CMP makes many different styles of tables and decontamination sinks for SPD / CSSDs, Soiled Utility and other hospital cleaning areas. CMP Reprocessing sinks are a vital component of the SPD decontamination area, along with CMP Pass Through Windows, and CMP Instrument Pegboards. These beautifully crafted processing sinks have the tools required to properly, safely, and effectively manually clean your instruments. CMP multi-sink workstations and sink units are designed for your specific Sterile Processing Department and Central Sterile Supply Department needs to meet Joint Commission Standards. 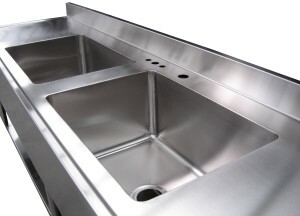 Options include single, double or triple sink configuration.